Get Awesome Social Media Engagement For Your Brand – Facebook Campaigns | ASTRALCOM - Content Strategy, Conversion Marketing and Customer Acquisition. Get Awesome Social Media Engagement For Your Brand – Facebook Campaigns | ASTRALCOM – Content Strategy, Conversion Marketing and Customer Acquisition. 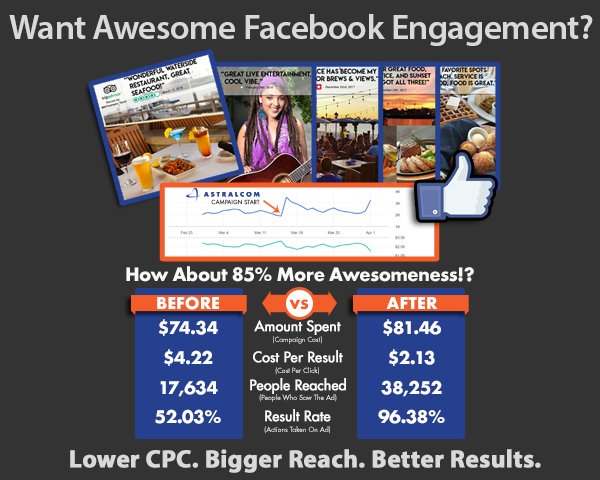 This ASTRALCOM-led Facebook advertising effort for a local restaurant delivered outstanding results. To be exact, it had an 85% better result rate, at half the cost-per-click and reached twice as many people. You CAN get the results you want from your digital advertising efforts with ASTRALCOM as your partner. Reach out to us today and we’ll make it happen for you!